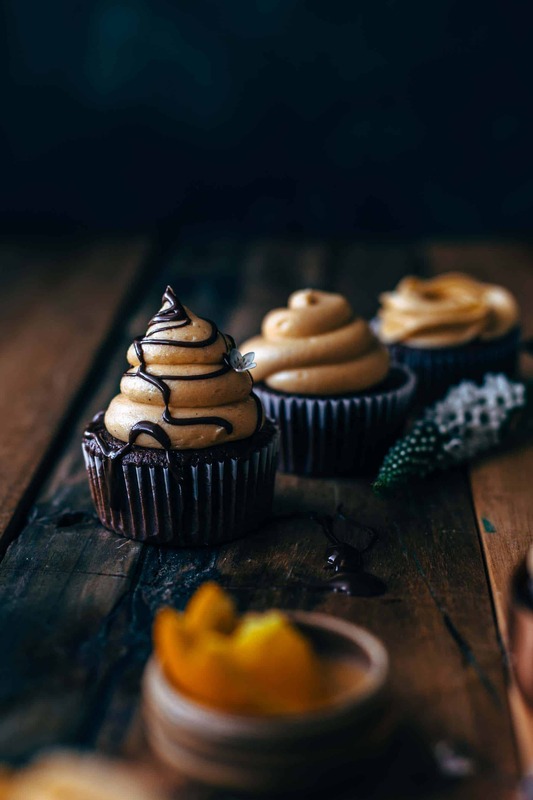 These Dark Chocolate Orange Cupcakes are so intense in flavors! 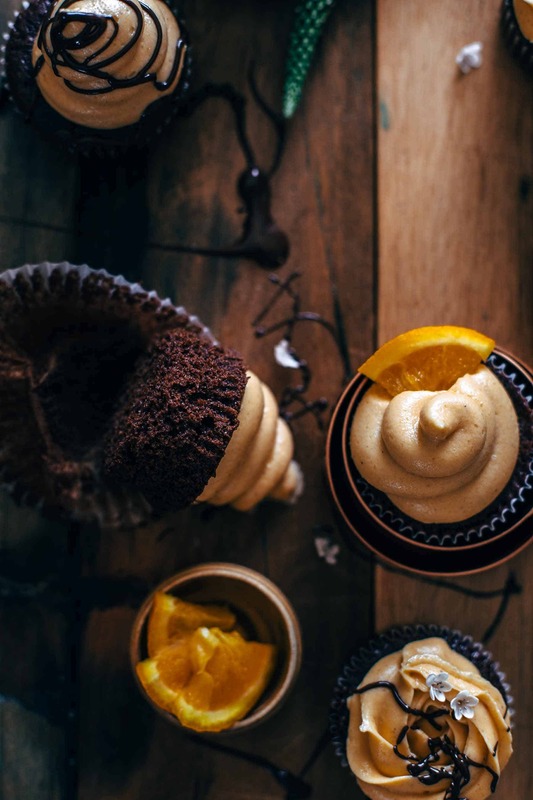 Fluffy dark chocolate cupcakes frosted with tangy-sweet orange buttercream. Easy to make. With video. Recently on Instagram, I asked my followers which kind of chocolate they love the most. Dark, milk, or white chocolate. Almost 90% voted for dark chocolate. That’s not a big surprise to me. Who doesn’t love dark chocolate and its deep and strong taste? It is indeed the most powerful kind of chocolate of all three. I don’t have a personal preference. I love all kinds of chocolate. You know me. I’m a chocolate addict. 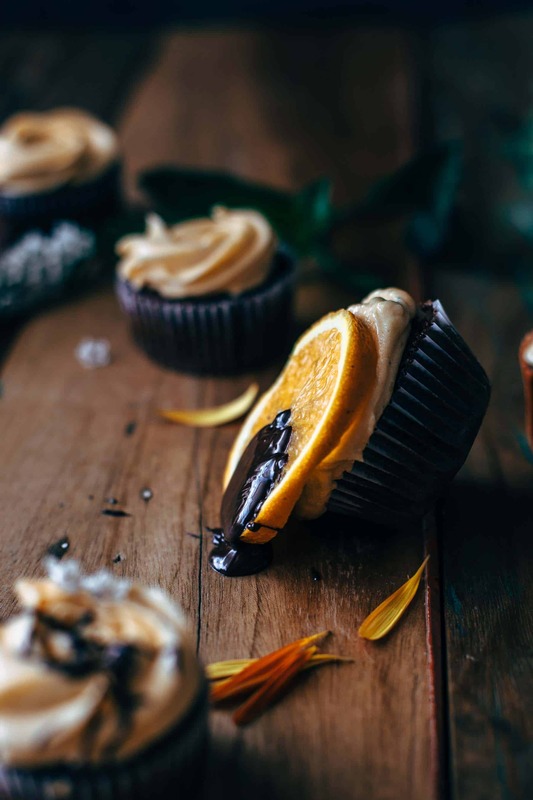 So if the majority loves dark chocolate, I thought I make these Dark Chocolate Orange Cupcakes just for you dark chocolate loving folks out there. Dark chocolate and orange is a killer combo! That’s well known. 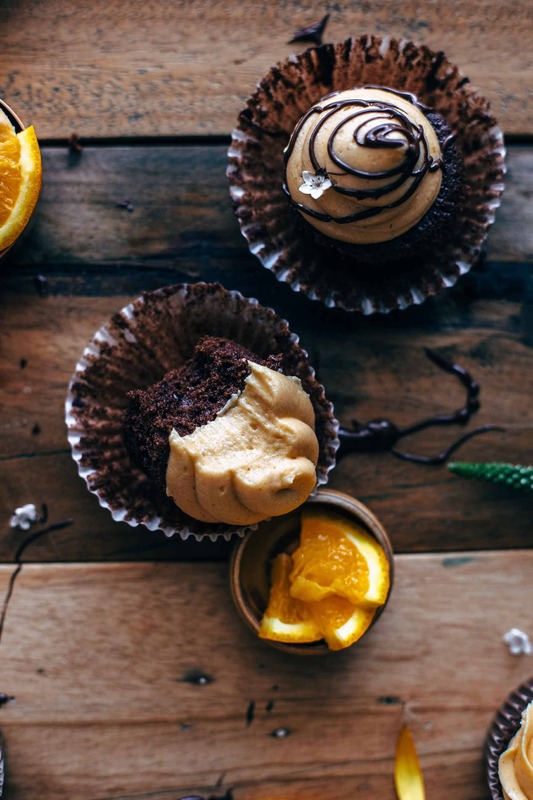 I decided to make intense chocolatey dark chocolate cupcakes and frost them with tangy sweet orange buttercream. That’s true dark chocolate and orange killer combo power! I’ve ever been having a thing for dark chocolate and orange. When I think back to my childhood, I always had such soft little cookies which were filled with kind of orange jelly and coated with a thin layer of dark chocolate. I don’t remember the name of these cookies anymore and if they were available outside Austria. But the taste of these cupcakes reminds me of these cookies. 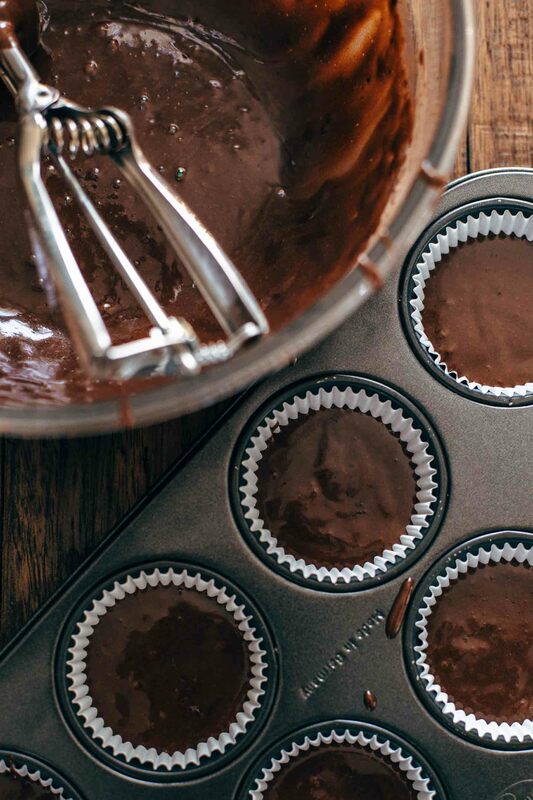 Making these dark chocolate cupcakes is fairly easy. Combine flour, cocoa, baking powder, and salt in a small bowl. In a large mixing bowl, mix egg and sugar until super creamy. Then add oil and vanilla. Alternately add dry ingredients and buttermilk. Then fill the cupcakes into cupcake liners about ½ – 2/3 full. Do not overfill the liners or your cupcakes will spill over or sink. This recipe calls for dutch-processed cocoa powder because I used baking powder. 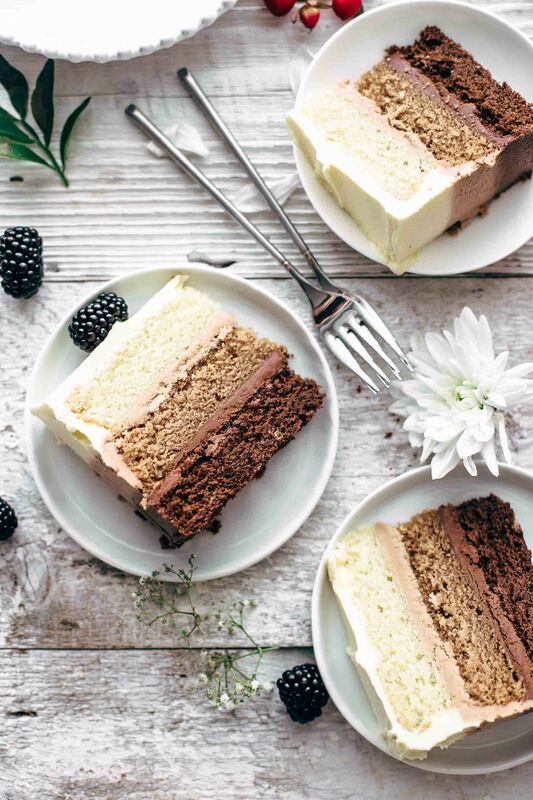 Whenever you see any chocolate cake or cupcake recipe where stands just unsweetened cocoa powder but also baking powder, you need to use dutch-processed cocoa powder instead of natural cocoa powder. Because of the different acidity in dutch-processed and natural cocoa powder, you need either baking powder or baking soda or a combination of both to get a reaction. Dutch-processed cocoa needs baking powder to let baking goods rise, natural cocoa powder needs baking soda to react with. In some recipes, you will find natural cocoa and a combination of baking powder and baking soda. That’s also fine. So from now, you won’t have any problems with choosing the right cocoa when it doesn’t stand in the recipe explicitly. I decided to use cocoa powder instead of melted chocolate because you need a much higher amount of melted chocolate to get the same intense flavor as with cocoa powder. Cupcakes need to be fluffy, right? 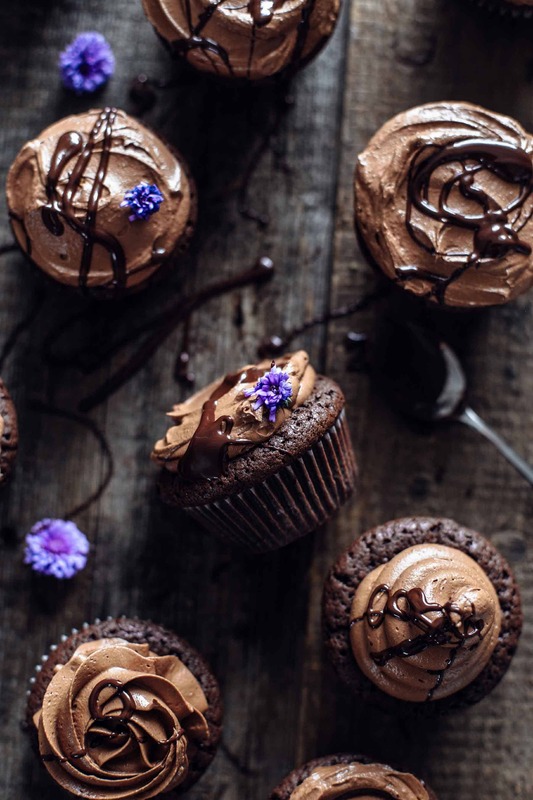 And with cocoa powder, the texture of the dark chocolate cupcakes is lighter and fluffier than with that amount of melted dark chocolate that you would need for a deep chocolate taste. I tried both and cocoa was definitely the winner. I wanted the orange buttercream to be all natural. No food coloring. Sometimes it’s not possible to get baking goods colored without food coloring. It’s great that food coloring exists but as long as I don’t do any galaxy cake, rainbow cake, or something like this, I go all natural. Did you see the color of my pistachio cake? The green color is just from ground pistachios! I love the power of natural food. The key to a lovely orange color in the buttercream is adding cooked orange syrup. 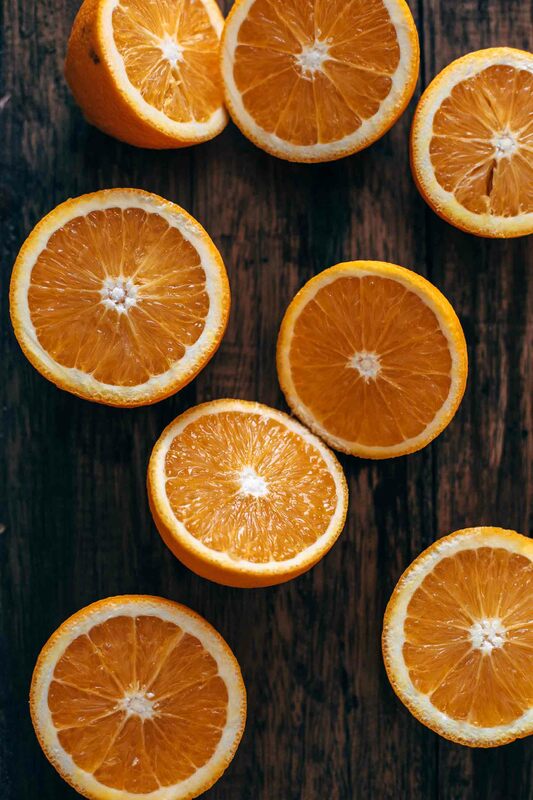 Just squeeze four fist-sized oranges (exact measurings in the recipe below) and cook the orange juice with sugar to a thick syrup. 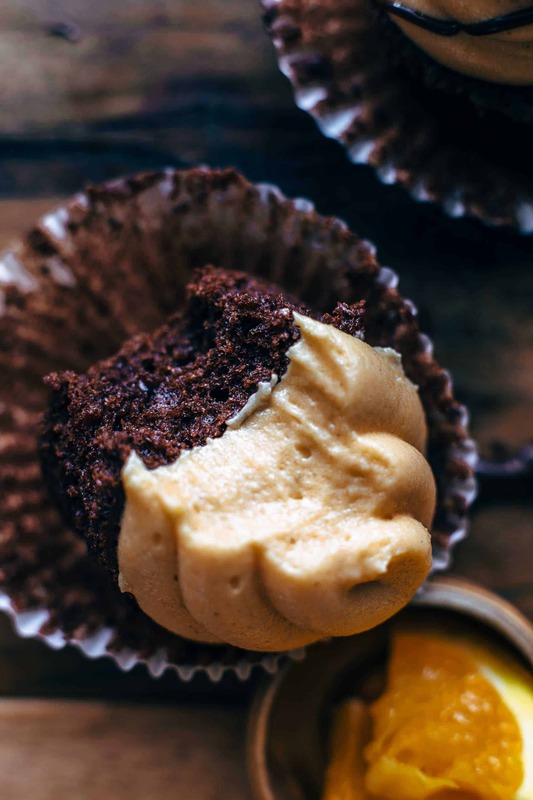 Let cool to room temperature before further proceed with the orange buttercream frosting. The texture of the orange syrup should be like honey or caramel syrup. If you accidentally overcook the syrup and it is too firm then add freshly squeezed orange juice and stir to combine. Add as much as needed to reach a honey-like consistency. 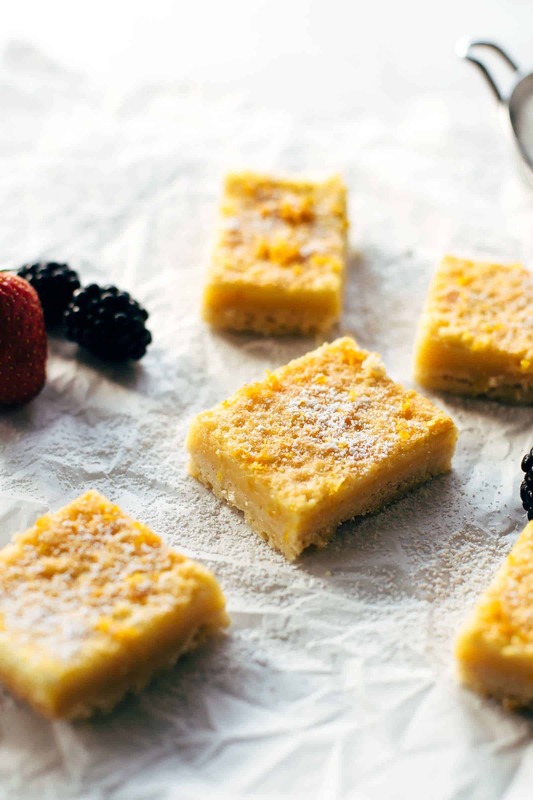 The frosting contains butter, powdered sugar, orange syrup, and vanilla. To get super fluffy and creamy buttercream, the butter needs to be room temperature and beat it until it is ultra creamy. Then sift in the powdered sugar, add vanilla, and the orange syrup. The buttercream will have a lovely but light orange color, an intensive tangy-sweet orange taste, and the texture will be beyond creamy. If you want to, you can add a drop of orange food coloring to intensify the color. 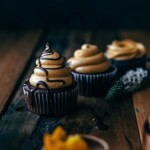 When you bite into these Dark Chocolate Orange Cupcakes you will be burst with flavors. 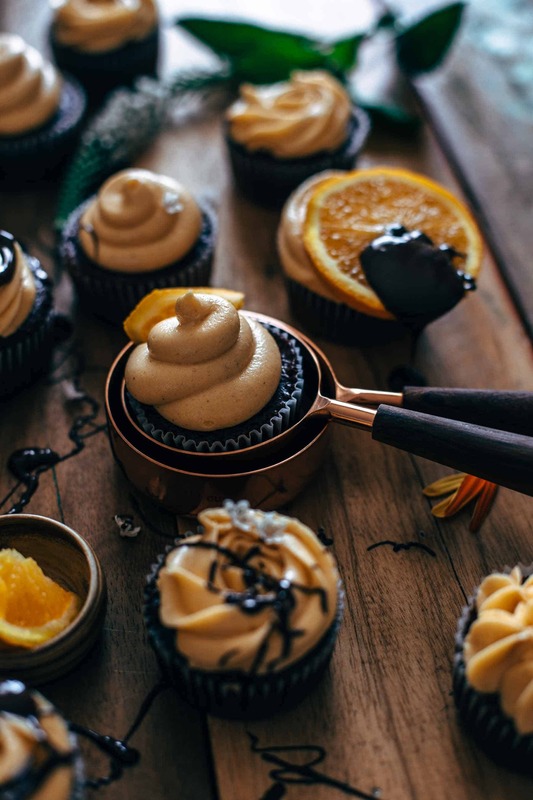 If you make this Dark Chocolate Orange Cupcakes recipe, leave a comment, rate it and tag a photo #alsothecrumbsplease on Instagram! Would love to see your snap! 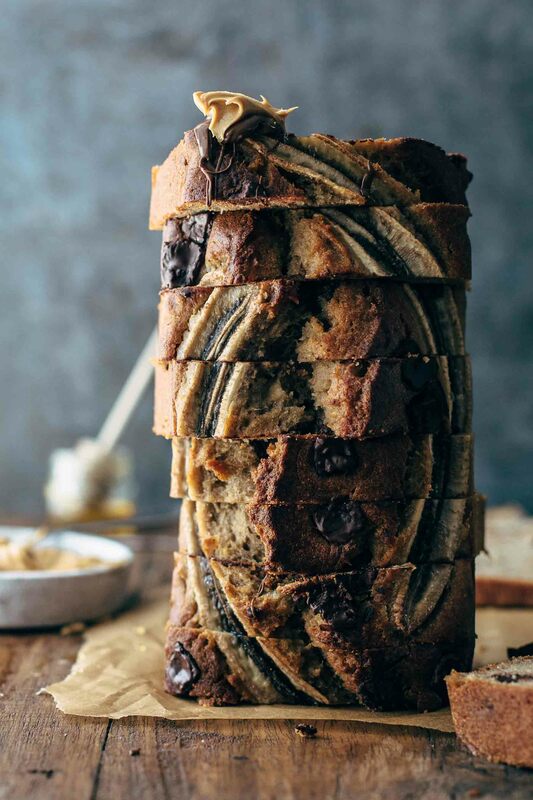 You may also like Brownie Cupcakes, Chocolate Peanut Butter Banana Bread, Irresistible Orange Curd Bars, Triple Chocolate Ombré Cake or click here to see all recipes. Preheat oven to 350°F / 175°C. Line two 12-cup muffin pans with about 14-15 cupcake liners (this recipe yields 14-15 cupcakes - I got 15 cupcakes). Set aside. Cupcakes: Stir flour, cocoa, baking powder, and salt in a large bowl to combine. Set aside. With a handheld or stand mixer fitted with a whisk or paddle attachment, beat egg and sugar until creamy for about 2 minutes. Add oil and vanilla* and mix on low speed until combined. Alternately add dry ingredients and buttermilk to the batter and mix on low speed just until combined. Begin and end with dry ingredients. Spoon batter into the liners and fill max. 2/3 full that your cupcakes don't sink or spill over the sides. Bake for about 18-20 minutes or until a toothpick centered in the middle comes out clean. Let cool to room temperature before frosting. Frosting: In a large mixing bowl using a handheld or stand mixer fitted with a whisk or paddle attachment, mix butter until creamy. Add powdered sugar and vanilla and mix until combined. Stir in cooked orange syrup until fully combined. Pipe or spread frosting on top of cooled cupcakes. Store in an airtight container at room temperature up to 3 days. 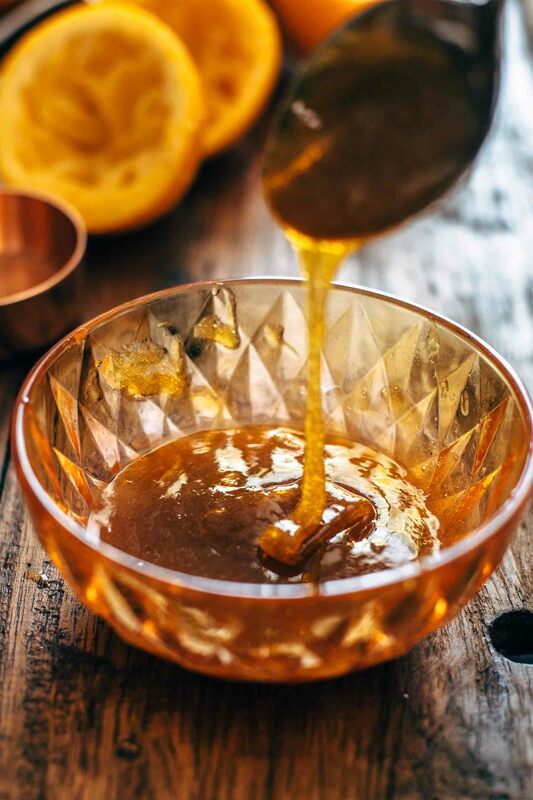 **The texture of the cooled orange syrup should be like honey or caramel syrup. If you accidentally overcook the syrup and it is too firm then add freshly squeezed orange juice little by little and stir to combine. Add as much as needed to reach a honey-like consistency. Yes, dark chocolate is the fav for many, many people! Ghiradelli chocolate is one of the best chocolate in the world. I can’t wait to try all the other high-quality chocolates in the US. Thank you for the tip, I just checked the blog and there are a lot of interesting insights. Have a great day, Amanda! So the first thing you should know is I don’t eat cake. It makes me hurt, but I love making cupcakes for my co-workers birthdays. So these were for Dr. Pandya, who’s med students named their group the Unicorns, much to Dr. Pandya’s consternation. They looked really great with pink, blue and gold sanding sugar sparkle, with unicorn cupcake holders and horn toppers. Everyone LOVED them, they may even have beaten the hometown buttermilk red velvet with cream cheese frosting. Thanks for a great recipe. I just love that! 🙂 Thank you so much for your comment and feedback, it made my day!